In Jan/Feb of 2007 Kim and I went to Australia to visit Sydney, Diving in the Great Barrier Reef, and touring Queensland's rainforest. I planned in advance to ask her in Sydney at the Opera House and had the ring with me that evening. Everything went well with my plan that day. We got a great room (Club Level) at the Intercontinental with a gorgeous view of the Harbour Bridge and Opera House. I told Kim it was going to be the most exciting day of her life when she got up. She thought I meant it was because we were going to climb the Harbour Bridge later in the day – and she was nervous. Anyways, we toured the historic Rocks area of Sydney – next to Circular Quay, and then took the 3.5 hr climb of the Harbour Bridge. After a late lunch we took a ferry to Manley Beach to watch the surfers. We got back and got ready for dinner at the Opera House’s restaurant Guillaume at Bennelong – one of the top restaurants in Sydney. When I booked this in December I asked for the best table and it was! The restaurant is located is the smallest of the 3 ‘shells’ of the opera house. We had a view of the Sydney skyline and Harbour Bridge. We sat just to the right of this picture, close to the window. Everyone working at the restaurant was in on the secret, so they gave me lots of space/time. After an amazing dinner, I got down on one knee and gave her the ring, which I had been hiding in my camera bag that whole night. The table was dimly lit except for a spotlight exactly where I placed the ring. Kim was utterly speechless, partly because she mentioned earlier at dinner that maybe she was waiting in vain for a proposal. I’m not sure what I said, nor does she, because she was fixed on the ring with her mouth wide open and I was trying to not drop the ring, but she did say “yes – of course” after I asked her again. The rest of the night she stared at the ring. We had fun diving on the Great Barrier Reef for 7 days, Spa treatments in the Daintree Rainforest, White Water Rafting in Cairns, and a historic train ride into Kuranda - around waterfalls, and of course lots and lots of shopping. All the while Kim and I were beaming with her new ring and thoughts of best friends getting married. We recommend you arrive on Wednesday, May 7th and no later than Thursday, May 8th with departure on Sunday, May 11th. We have a welcome reception planned on Thursday at 5pm and a group excursion to Old San Juan planned for all day Saturday. To really make a vacation out of this trip, plan on arriving even earlier! American Airlines offers daily non-stop service from Chicago. It is a short 4 hour flight. We suggest you take the earliest flight possible to account for the time change (Atlantic Time Zone - 1 hour ahead of Chicago). This allows you to still have plenty of time to get to the Resort and then relax at the pool or beach. For flights, booking directly through American Airlines usually offers the best rates. And when you are ready to book your accommodations, click here to book online as we have a special room rate for our guests! Also check for deals on Orbitz, Expedia, or the El Conquistador website that include flights and hotel, as you might find an even better package. When booking your accommodations, make sure you let the Resort know you are part of the Fisher/Kuchipudi wedding party or click here to book online. Make sure you also call the Resort and arrange for airport pickup by the Resorts' Shuttle service ($33 one way). We definitely recommend this, as driving and navigating in Puerto Rico takes some experience. Also during the drive, they provide refreshments, and a welcome video about the resort, with the ability to pre-register en route. If you really want to drive, click here for directions. Also, there is Enterprise Car Rental at the resort, so you can make your mind up later. 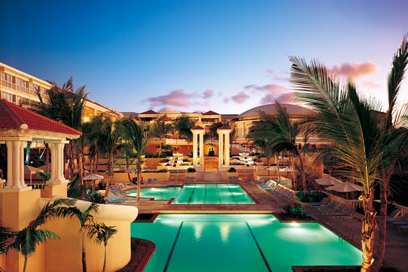 The El Conquistador Resort and Spa (www.elconresort.com) is located by Fajardo, which is in the north eastern corner of Puerto Rico. It is approximately a 1-1.5 hours trip from San Juan Airport and we recommend using the Hotel shuttle service ($33 one way) as driving will certainly be an adventure. Also road markings are almost non-existent, so finding the resort can be difficult the first time. Click map for bookmarks to all the best places to visit! At the Resort, there is an Enterprise car rental available, if you really want to venture out on your own. 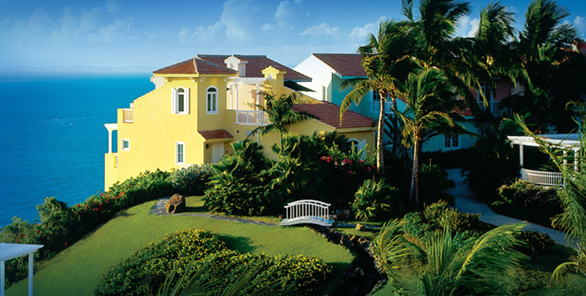 However the resort offers daily excursions around the island, so you may never need a car. Take a look at the pictures and videos on their website as well as the pictures we took. When you are ready to book your accommodations, click here to book online as we have a special room rate for our guests! For accommodations, we recommend the Las Casitas Villas (pictured above), which offer 1, 2, or 3 bedroom private getaways, next to the main resort. Some units have kitchenettes, and all offer stunning views of the ocean or golf course. The wedding ceremony will be held outdoors, next to the Villas, just in the foreground of the picture above. After Christopher Columbus arrived in 1493, the island was colonized in 1508, and the capital city of San Juan founded in 1521. 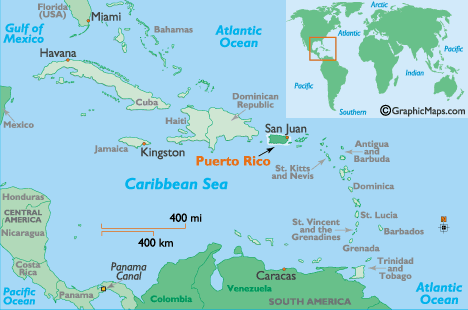 As a result of the Spanish-American War, Puerto Rico was relinquished to the USA by Spain in 1898. Today it is a self governing (very independent-minded) territory of the USA, and enjoys much autonomy. The narrow coastal plain rises into green (low) hills and mountains central and south. A few small rivers and lakes dot the landscape. The climate is usually hot and humid, with some lower temperatures found in the higher elevations. 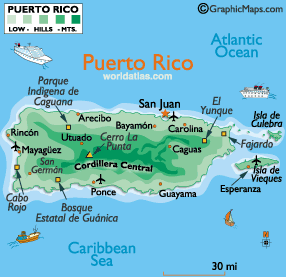 Like most Caribbean islands, Puerto Rico is subject to an occasional hurricane warning (May - October). The island is a mecca for Caribbean cruise ships and tourists from around the world. Old San Juan is the most popular destination. Compared to other islands in the Caribbean, Puerto Rico has a high standard of living with a vibrant industrialized economy. Click map for bookmarks to our suggested places to visit! Puerto Rico is part of the United States, so there are no travel restrictions or passport needed for US Citizens and for Canadians, they just require a Passport. It is an easy 4 hour, non-stop flight from Chicago to San Juan, the capitol. All electricity, money, and language are the same as in the mainland USA. Although, both English and Spanish are the official languages of Puerto Rico, once off the beaten path, don't expect all the services you are used to back home or that everyone you meet will speak English. The Weather is typical Caribbean tropical. In May, expect temperatures in the high 80's, but the trade winds keep the weather feeling a pleasant 74'F all year around. Also, this time of year, expect short rain showers daily in the north-eastern part of the island and up in the rain forest. Guests: here you can get information here to start planning your visit to Puerto Rico. Others: stay connected with us through pictures and our posts on everything from planning our wedding till the big day!